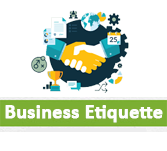 Business Etiquette is a set of norms that should be followed in order to consider socially-acceptable behavior and conventional manners are expected in a place, or while interacting with people with certain degree or rank, age. It teaches us the acceptable and conventional ways of interaction within a section of people or group or society. Every culture is unique and has set of different properties, manners and lots of them are common among other cultures. To know a behavior if socially acceptable or not is answered by Business Etiquette. This section is mainly focused on the young professionals who have their careers just started and are enthusiastic in knowing the working boundaries of how companies are operated. This can also be a reference guide for aspirants before stepping into the corporate world. One should have a calm mindset, flexible and ready to invest in exploring the suggestions mentioned here.